The Yorkshire Dales have fired the imagination of artists and writers for generations. Lewis Carroll and Charles Kingsley found inspiration among the meadows and ancient green pastures of Malham Tarn and Wensleydale. J.M.W. 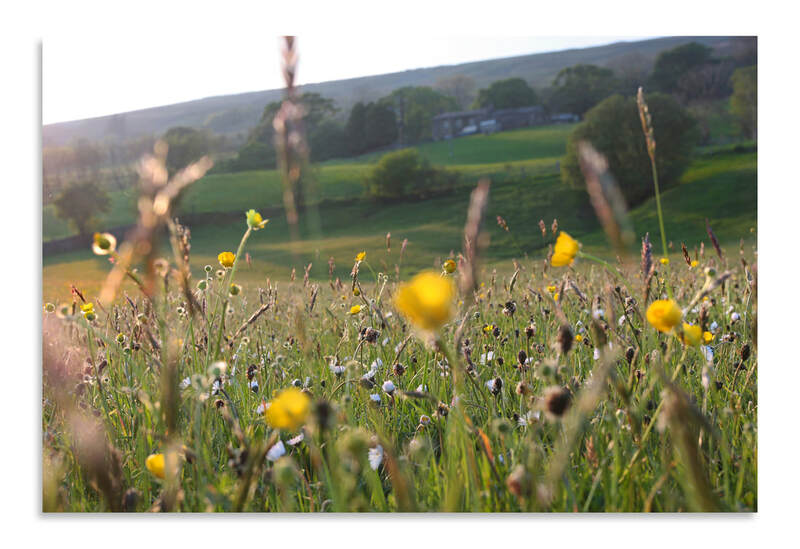 Turner particularly loved the area around Askrigg and Hardraw Force. Look out for work by modern artists such as Mackenzie Thorpe's square sheep in Richmond, Emerson Mayes from Nidderdale, Piers Browne in Wensleydale and Ian Scott Massie in Masham and Stacey Moore who produces exquisite coloured pencil drawings of the local wildlife in her gallery in Hawes. Print maker Anna Tosney’s deceptively simple work features sheep, dry stone walls and bird life. Moira McTague is a Painter/ Printmaker, primarily working as an etcher on copper. She is very much inspired by Nidderdale and wildlife to create her incredibly detailed paintings and etchings. 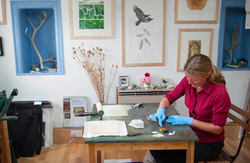 Penny Hunt works in paint, print and ceramics and has a delightful small studio in Horton in Ribblesdale. Emmeline Butler's wheel-thrown sculptural ceramics are greatly influenced by natural textures, with limestone pavements and tree bark reflected in the surface patterns of her unique ceramic pieces. Creative sculptor Eric Moss finds inspiration in the plants growing near his studio beside the River Swale to create complex and beautiful abstract ceramic sculpture for the pocket, home, garden and office. The 'Page Paper Stitch' team are three textile artists, Annwyn Dean, Joan Newall and Elizabeth Shorrock who all share a love of stitching and beautiful bookmaking. 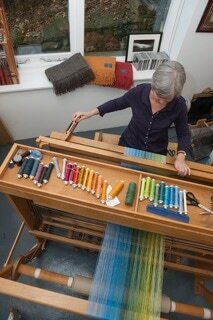 Wander into Farfield Mill and you will also find the Chrissie Day Felt Studio. Chrissie - an award winning Fibre artist - is inspired by colours in the local flora /fauna and is passionate about British wool which has provenance. Textile lovers will thoroughly enjoy browsing around Farfield Mill in Sedbergh where you can see huge looms, learn about 'the Terrible Knitters of Dent' and see the work of all of the artists and makers who are based at the Mill. There are changing exhibitions so there’s always something new to see. There are more wool creations to be found at Craftworkshop in Sedbergh, too. Lone Helliwell knits flowers, birds and other creatures in British wool. Andrea Hunter displays her unique felt pictures in her Gallery, Focus on Felt in the hamlet of Hardraw. Jo Hunter makes contemporary felt pictures and vessels while felt artist Em Fountain creates incredibly life-like animal sculptures such as hares. Louise Curnin is a feltmaker and milliner, making felt art, handbags, scarves and other wearable pieces as well as accessories for the home inspired by the colours and shapes of the surrounding landscape. Louise also offers workshops locally for those wishing to learn the ancient craft of feltmaking. Former tax accountant Annabelle Bradley designs and hand forges sculptural and functional wrought ironwork at the Malham Smithy. Lucy Sandys-Clarke often works to commission from her hidden smithy in Dent, producing domestic items such as window and door fittings. Each has their own distinctive style, but all focus on handmade pots using traditional methods. Frank Gordon is a long-established landscape artist whose distinctive work usually derives from sights experienced within walking distance of his home in Giggleswick, in Ribblesdale. Harrogate artist Katherine Whitby uses water mixable oil paints on canvas to capture everything from the not so humble garden bird to the vast vistas of the Yorkshire Dales. Well established artists Robert Nicholls and Judith Bromley welcome you into their home at Askrigg Studios to view their wide range of originals, prints, books and cards. They use many different paints, papers and canvases, large and small, to create a variety of images from traditional to a more exploratory approach. They really are a feast for the eyes. 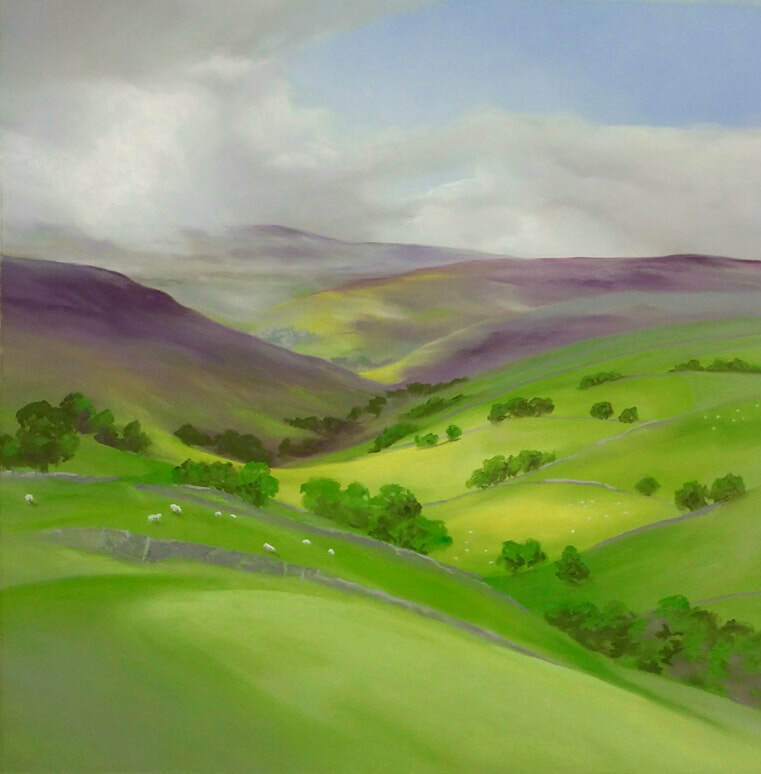 Contemporary landscape painter Lucia Smith offers our familiar Yorkshire Dales with a different twist: simplifying the contours and using colour to portray our joy of these glorious spaces, whatever the weather. ​The Studio Vault in Settle is small but beautiful, featuring work by owner and jeweller Emily Knight, with changing displays of work by other makers. 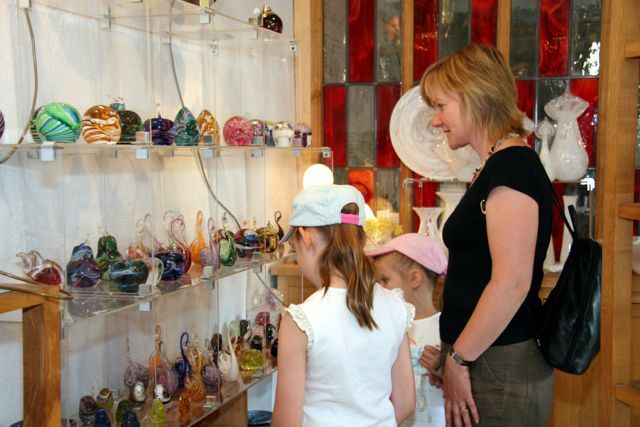 Gavagan Art is next door, filled with beautiful high quality art, ceramics and glasswork. Beautiful special gifts. The Shop at The Station in Richmond prides itself on offering exceptional design from a variety of artists, and there is usually an exhibition on the first floor of the former station building. For gifts and artworks with the wow-factor take a trip to Tennants Auctioneers in Leyburn where there are displays for forthcoming sales as well as special exhibitions and a welcoming restaurant. Fleece in Reeth is a small shop and gallery formed through a co-operative of over 20 local artists crafting unique handmade pieces. Go and find an ideal gift. the Courtyard near Settle, a collection of re-furbished former farm buildings, now housing businesses such as Dalesbred and Abraham Moon. The shop at the Dales Countryside Museum in Hawes has a small selection of locally made products while the nearby Herriot Gallery houses a constantly changing selection of paintings and other artwork by artists such as Peter Brook, Moira Metcalfe and Piers Browne. Town Head Farm Shop near Airton has a good range of gifts and products made in the Yorkshire Dales. With two floors of art and crafts, and regular exhibitions, discover the best regional and UK artists and makers at The Old School Muker, situated in magical, serene Upper-Swaledale. Berry’s Farm Shop at Swinithwaite in Wensleydale has a range of locally made hand-crafted gifts. The Just Makers Gallery is just outside the Yorkshire Dales in Ripley and features makers from the local area. Art, action and abstract photographer Stuart Petch is also landscape photographer for the Settle-Carlisle Railway in the Dales. Exploring remote and quiet places he shows you what you might’ve missed. High hill views, and birds and beautiful abstract natural water studies in secret pools. The Sedbergh Soap Company was founded by Dorthe Pratt, a long-time eczema sufferer, who started making her own soap for sensitive skin. The range has now expanded to include gorgeous goodies smelling of lavender, lemongrass, tangerine, and geranium. Masham is home several artists and small galleries. Painter, printmaker and poet Ian Scott Massie creates atmospheric landscapes in watercolours and as screen prints. Josie Beszant’s work is often based around the idea of collections and memories, evoking strong emotions and telling the stories behind half-forgotten ephemera. You can see their work at Masham Gallery. alongside that of many other artists and makers. ​Nikki Corker’s Little Picture House Gallery is filled with naïve, vibrant pictures while Nolon Stacey’s Gallery features his very detailed, pencil drawings of British wildlife, dogs and farm animals. Maureen and Tim Simon at Uredale Glass have been blowing brightly coloured glass for many years and their daughter, Zoe is now taking on the mantle, specializing in fused glass. Charlotte Morrison hand builds delicate ceramic vessels inspired by local landscapes and vintage items. Stone carver Gaynor Pearson works to commission and you'll increasingly spot her work around Masham. Look out for the two Masham sculpture trails - the Leaves along by the river and the Swifts. VisitMasham has leaflets to show you where they all are. You can even learn to create your own artistic or craft masterpiece at ArtisOn near Masham. Twice a year, Masham plays host to a high quality event, Crafted by Hand when carefully selected craftspeople show their talents. More artists who live in and near the Yorkshire Dales and who are inspired by the local landscape include painter Margaret Uttley, David and Heather Cook in Malhamdale, Malham's Katharine Holmes, portrait painter Sam Dalby, creative landscape painter David Knight in Settle, Lynn Ward and Denise Burden in Leyburn, Judi Allinson in Scorton, mosaic artist Ruth Wilkinson and Sarah Garforth who works in her Ramsgill Studio in Nidderdale. Jo Garlick usually works in pastels to create very lifelike images of animals and the natural world. Anne Mackinnon is also inspired by local landscapes and the patterns and shapes displayed in nature. Jacquie Denby creates vivid abstracts. Dales fine artists Rebecca Wallace Jones and Pip Seymour have joined forces and produce unique ranges of oil, acrylic, watercolour, gouache, hand-made soft pastel, hand-made drawing materials, primers and painting mediums from their base in Horton in Ribblesdale - selling these via stockists throughout Europe and the UK.